Those soapbars pack a punch. Neck P90 is a bit much. The Jetstream 390 is part of Reverend's Bolt-On Series. Harping back to the body shape of a Jazzmaster, this offset beauty has been cut from korina this time around - think mahogany but lighter. If you're expecting a chunky vintage neck, you might be surprised at the more modern profile of the Jetstream. It's comfortable to play and the cutaway leaves the top end wide open. "You're reminded exactly why P90s are so revered." Other noteworthy features are the Reverend Pin-Lock tuners and a bass contour pot for rolling off low frequencies. Onto those soapbars then. Plug in and select the neck pickup, and you get a booming low end that could become overpowering, but reaching for that bass contour cures the excessive rumble. Reverend claims that the "in between" positions will give you Strat-alike tones. Position two is good enough, but select position four, give it some welly and it quacks like Count Duckula after a vindaloo! The bridge position opens up with that characteristic soapbar bite - and you're reminded exactly why P90s are so revered amongst guitarists. 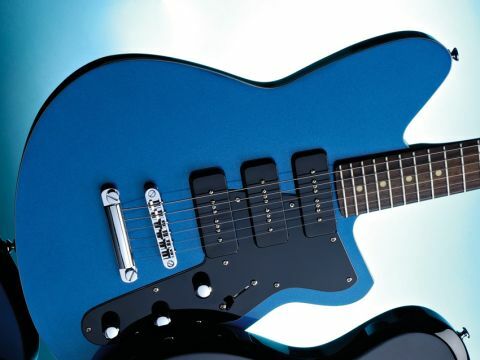 Reverend has come up with some interesting features that culminate in a vintage-style guitar with modern playability. The versatility of the tones makes it a perfect choice for those who want something a little different from the usual single-coil/humbucker guitar.